Scandal costumes may seem simple, but consider the expensive fabrics and designs, and finished look. Is there any modern character on TV with a classier look than Olivia Pope of Scandal? 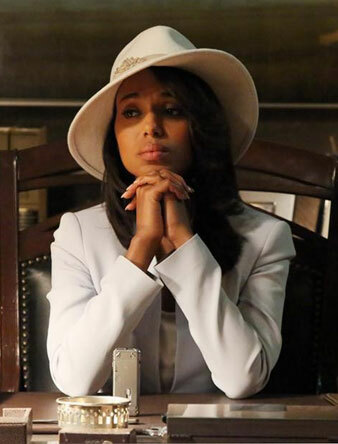 I started watching Scandal just recently, and wish I had Olivia Pope’s grace under pressure, as well as her wardrobe. So many female characters on television (and movie!) dramas are so often dressed in dark colors, so I love Lyn Paolo’s choice in costuming her in white, pastels and other more feminine colors, as well as designers that range from Tory Burch (the iconic white trench from Season One) to Prada to Alexander McQueen. While we all don’t necessarily have Olivia’s grace under pressure (or her couture wardrobe), we can still achieve her polished look with a little help from Manhattan Wardrobe Supply of course! How Does Olivia Pope Keep Her Whites So White? Olivia’s Scandal costumes feature a lot of whites and pastels and she is seen most often wearing them while slinging around large glasses of red wine or standing over someone bleeding. What do you do to keep them white? 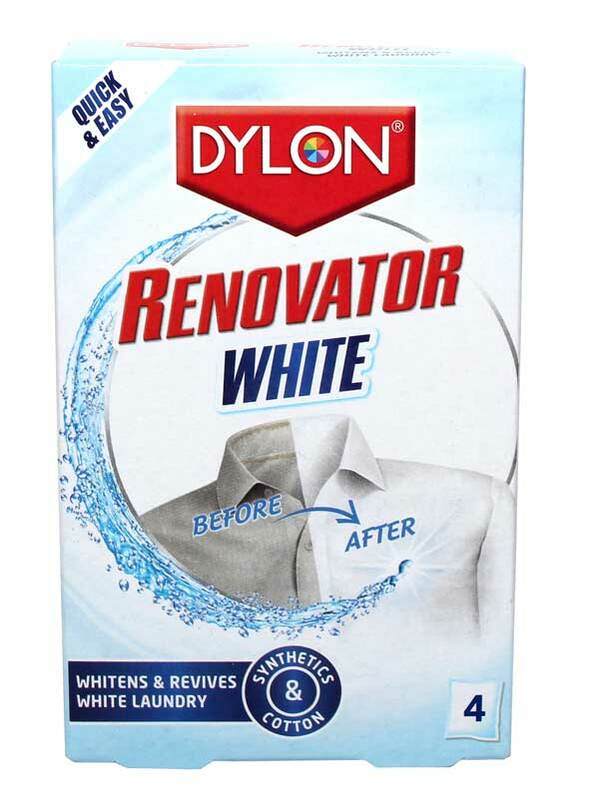 For the items that are washable that have maybe turned a bit yellow, try Dylon Renovator White. It will take the yellow out, and uses optical brighteners to make your all-whites (no cream!) sparkle. 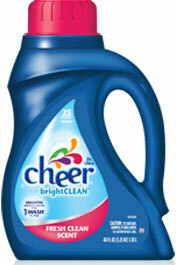 For other white and cream items, don’t forget to treat them right when you wash them: we like Cheer Bright Clean, which whitens in just one wash. It’s also dye- and fragrance-free. You’ll also need some Clorox 2. It’s great for whites that have spandex– bleach degrades spandex– and keeps them bright and beautiful. How DO you get dirt out of your press correspondent’s gown? On the show, Olivia and her cohorts throw on formal gowns weirdly often. While it’s unlikely that you’ll be wrestling a rival political operative on the White House lawn and end up with grass stains on your Elle Saab, it’s always best to be prepared. We like purse-sized stain removers– just in case. If you have an incident while in your white gown with salad dressing or anything else that is greasy for that matter, Janie Stick is great. The white powder will blend in with your whites while it is absorbing the stain and then you simply brush off the powder after 5 minutes. It works best on grease, oil and dairy based stains. Is your dress silk? Keep Silk and Clean wipes in your bag as well — they also come in handy for lipstick stains on the President’s ties. For most dry cleanables, a Dryel Instant Stain Remover Pen in your purse can handle stains on the go, too. Think like Olivia in her Scandal costumes, and with the products below be prepared for everything. What do you need before you step out in front of a press conference? 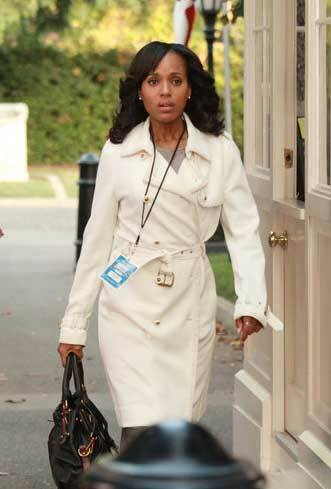 Olivia Pope never has a hair out of place, a loose thread or a fashion misstep when she steps in front of the press. While you may not be wearing Scandal costumes- do you need to be camera-ready, or do you just have a big presentation? There are three things that an expert “fixer” like Olivia would never be without in front of anyone — particularly at an important event. 1. A lint brush. You can’t go in front of the White House press corps with cat hair or random fuzzies all over your suit. A lint brush– the traditional Richard’s Homewares clothes brush or the ones made of sticky sheets, like Bounce Lint & Freshness roller— will make sure that your suit or trench coat or dress looks picture-perfect. 2. Wrinkle releaser. Most of us don’t have someone who can steam us before we go to our big presentation, and getting in and out of cars or off the train will wrinkle even the best-pressed suit. A quick spritz of wrinkle releaser, like Downy Wrinkle Releaser, will make you look crisp and polished in just a few seconds. 3. Blotting papers. Whether you’re blotting your nose or your bald pate, no one wants to shine on camera. A little blotting paper goes a long way — they absorb not only oil, but sweat (those press lights get hot, you know). That way, the public can focus on your smart monologues instead of on your shining forehead. Is Scandal your favorite TV show? How do you deal with pressure like Olivia does? We may not be able to help you fix problems in your personal or professional life, but Manhattan Wardrobe Supply can make sure you always look good. Tagged Costumes, Olivia Pope, Scandal, Whites. Bookmark the permalink.